The optioned land is in addition to the 263 acres the two counties purchased from the Orkin tract earlier this year and that is being used by Caterpillar for the plant under construction on the eastern edge of Bogart. The option agreement means that Caterpillar, rather than the Orkins, will begin paying the property taxes on the land, and that the two counties got a set price for the property, should they want to make purchases in the next three years. The counties paid $9.2 million for the 263 acres they bought from the Orkin family in March of this year, or $35,000 per acre. According to the option agreement, which I obtained from Oconee County late last week, the two counties will pay $35,000 per acre for any land purchased on or before Dec. 31, 2013. The purchase price will increase by $5,000 per acre for land purchased in 2014 and an additional $5,000 per acre for land purchased in 2015, the final year of the agreement. The actual price per acre will be prorated for each day of the year, starting in 2014, so, for example, land purchased on July 1, 2014, would be purchased at $37,500 per acre. Oconee County Attorney Daniel Haygood, who made the announcement of the decision to go forward with the option agreement to the Oconee County Board of Commissioners on Tuesday night, emphasized that the development authorities and the counties were not committing to spend any additional money as a result of the option agreement. The option agreement does stipulate that the counties will not be able to exercise the option, that is, purchase any property, until they provide “evidence satisfactory” to the Orkins that “funding is in place by the purchaser or CAT” to extend Dozer Drive from the Caterpillar facility to Mars Hill Road. The counties are building Dozier Drive off the Atlanta Highway as the main entrance to the Caterpillar Plant. Its construction is part of the improvements the counties agreed to make to the property to lure the Caterpillar plant to the area. Oconee County borrowed $10.4 million to cover its part of these expenses. Athens-Clarke County borrowed another $6 million and agreed to contribute Special Purpose Local Option Sales Tax revenues to the project. The two counties have agreed to split equally the costs of the project and the revenues it generates. The advantage for the Orkins is that Caterpillar will be responsible for paying the property taxes on the land covered by the agreement, effective with the signing of the agreement by the two authorities last Tuesday. The extension of Dozer Drive also will make land remaining in the Orkins’ hands more accessible. The agreement covers two contiguous tracts, one of 137 acres and the other of 67 acres. The two tracts come out of the middle of the original Orkin property. The larger of the two would be southeast of the site of the Caterpillar plant and the smaller would be south of it. The smaller parcel borders SR 316. The option agreement says that the two counties can assign the agreement to Caterpillar or “any of its divisions and/or subsidiaries.” If the counties want to use the land for another purpose, they need the approval of the Orkins. 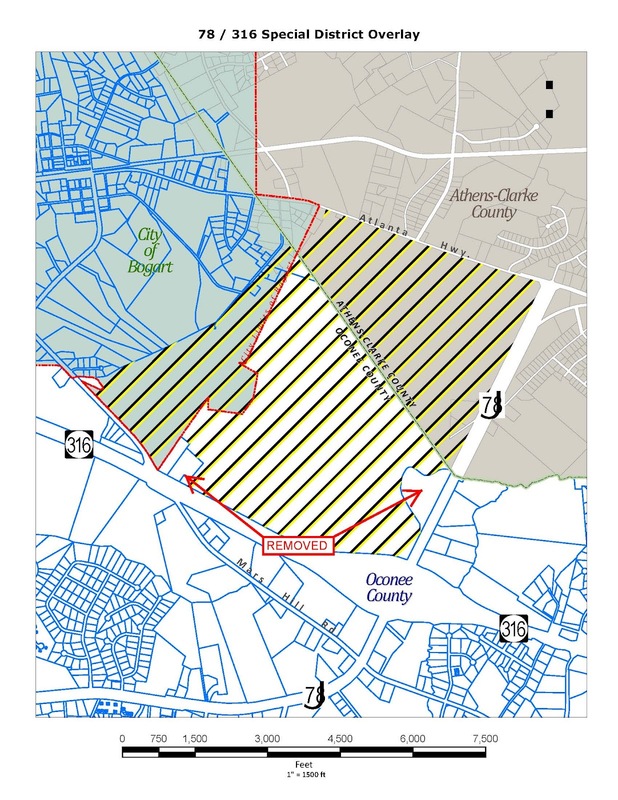 The original Orkin tract is described in the intergovernmental agreement between Oconee and Athens-Clarke County as consisting of “approximately” 838 acres. That means the Orkins would have 371 acres still available for development. The Oconee County tax records list Southeastern PVC Pipe Manufacturer as the owner of the land in the county, with Kenneth Orkin of Marietta as the contact person. The Clarke County tax records list Barbara Orkin and Southeastern PVC Pipe as the owner of the property in that county, again with a Marietta address. Daniel Haygood told the Board of Commissioners Tuesday night that both the Oconee County Industrial Development Authority and the Development Authority of the Unified Government of Athens-Clarke County had approved the option agreement on Tuesday. At the Oconee County IDA meeting, which lasted only seven minutes, Chairman Rick Waller told the members that the agreement before them was one that they had talked about earlier in executive session. In fact, the agreement Oconee County provided me last week carries an effective date of March 6, 2012, which was the date of the purchase of the original 263 acres for the Caterpillar plant site. County Attorney Daniel Haygood assured me in an email message on Friday that the document I had was the “one just adopted” by the two authorities. At the IDA meeting, Daniel Haygood reviewed the basic details of the agreement for the members, who voted unanimously to approve it. The full video of the IDA meeting, recorded by citizen Russ Page, is on the Oconee County Observations Vimeo Site. At its meeting on Tuesday evening, the Board of Commissioners took action on two others issues related to the Caterpillar plant. The overlay district includes portions of Athens-Clarke County, Oconee County and the city of Bogart, which straddles the border of the two counties. The goal of the overlay district is to promote development in the district and to establish uniform procedures for review and approval of projects in the affected area across those three jurisdictions, according to the document approved by the commissioners. Developments inside the district must meet the standards set forth in the approved document. It allows industrial and commercial use, including retail outlets, restaurants and hotels and motels, but it prohibits all residential units and churches. The county excluded three properties from the district, though they initially had been included. The largest, fronting on U.S. 78, is owned by Mike Powers and contains two storage warehouses, according to tax records. The other two properties are owned by Ralph and Nell Loyd and contain a small house and a mobile home, according to tax records. The properties are on Mars Hill Road where the northern section of the road meets SR 316. B.R. White, director of the Oconee County Planning Department, said at the meeting Tuesday night that he decided, after talking with the property owners, that it was best if their properties not be included in the overlay district. He said the owners can ask for their properties to be included in the future. Applications for any modifications in the existing zoning in the Oconee County portion of the district are to be reviewed by the Oconee County planning staff before any rezone request comes before the Oconee County BOC. 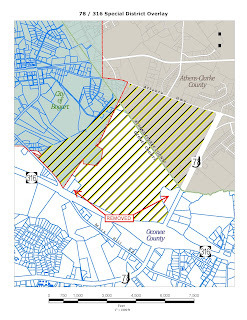 The BOC on Tuesday night also approved an intergovernmental agreement with Bogart that designates the Oconee County Planning Department and the county’s code enforcement officer as the city’s agent in issuing approvals required by the city’s zoning and subdivision regulations for the Orkin tract. The county also agreed to provide planning, inspection and permitting services for the construction of any improvements within the boundaries of the Orkin tract at no cost to the city. The agreement already had been approved by the city of Bogart, according to the document released by the county.